Let me tell you about the time I made Tamales. It was almost exactly a year ago. Well, it was just after Christmas and if you were reading back then you may remember we had twenty-one people in ONE house. Food was going quick, but we always have some sort of Mexican dish on New Years Eve. Sure, we could have ordered out and made things super easy, but I had the brilliant idea to make a Mexican feast. Only, it was not all that brilliant for me. I am not sure what I was thinking trying to make homemade tamales for the very first time for twenty-one plus people (yeah, there where friends too). I am insane and normally I have fun cooking, but these tamales were just not fun. I spent the entire day on New Years Eve cooking beef and shredding beef, trying to spread the masa evenly in the corn husk, wrapping tamales and then trying to figure out how to steam them with any kind of steamer. And then I made Mexican rice, chorizo and guacamole. Let’s just say it was a good thing that New Years Eve is such a long night. I needed it. In all honesty the tamales turned out pretty good for my first time, but they were not pretty and I probably messed up multiple things within the recipe. Luckily that did not seem to stop anyone and they all got eaten. I have to say though, the guacamole was the winner of the night, with the chorizo coming in close behind. Then the tamales. I am pretty sure I want to try again this year. My cousins are coming out again for Christmas and I am just not sure we can do New Years without tamales. So this meal was kind of getting me prepped. 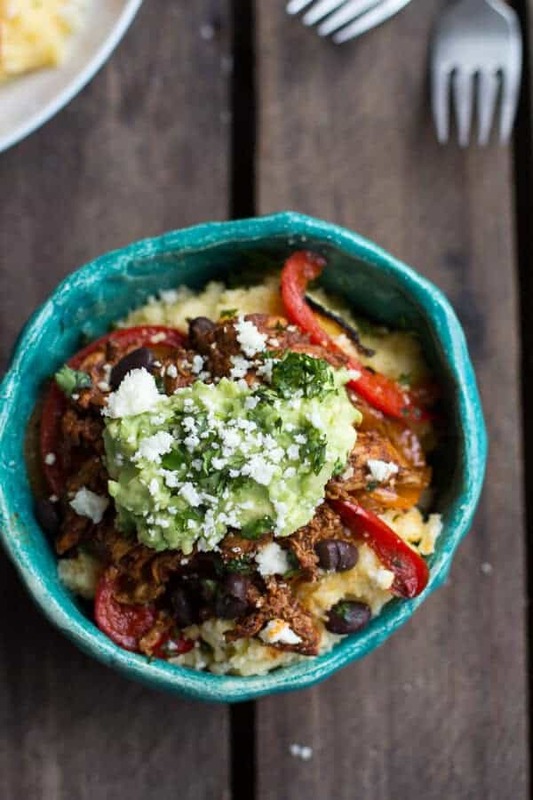 These burrito bowls are so easy, but they taste like tamales. Well, they have tamale flavors. Authentic tamales are made with beef, but I only had chicken on hand and I wanted to keep things on the healthier side. 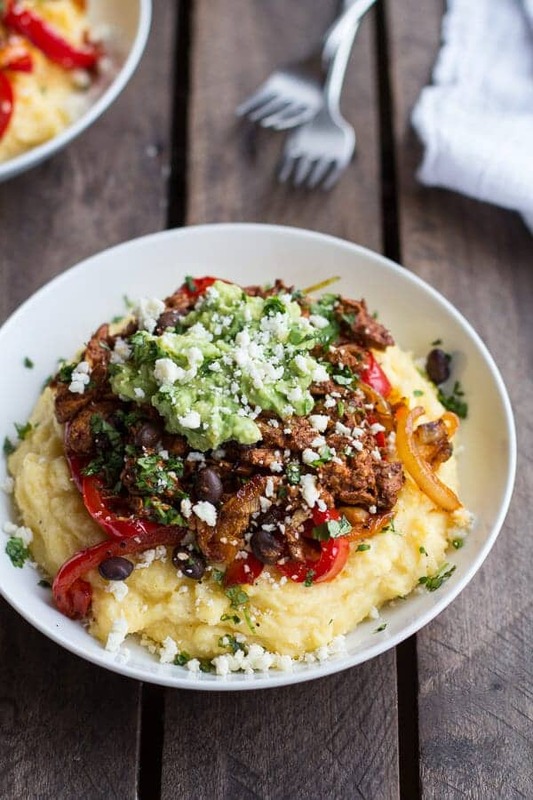 I have to say, polenta makes an awesome base to a burrito bowl. Plus, it’s fun to switch up the rice, and polenta works really well with the saucy chicken. It is extra creamy and creamy is always, always good. Especially during cold winter days. The best part is that this is so versatile. Use your favorite meat or whatever you have on hand. Just make sure to adjust the cooking times. And if you want to go vegetarian try swapping all beans for the chicken or using lentils. I think both would be SO good, but my family hates beans, so that was just not an option for me. Oh, and I totally forgot to add the crushed tortilla chips to the top of this, but really you must do this. It is so good. 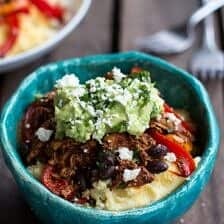 To make this in the crockpot add everything except for the polenta (the chicken, enchilada sauce, spices, peppers and onions) right into the crockpot bowl. Add 1 cup of chicken broth and cook on high for 4 hours or on low for 6-8 hours. 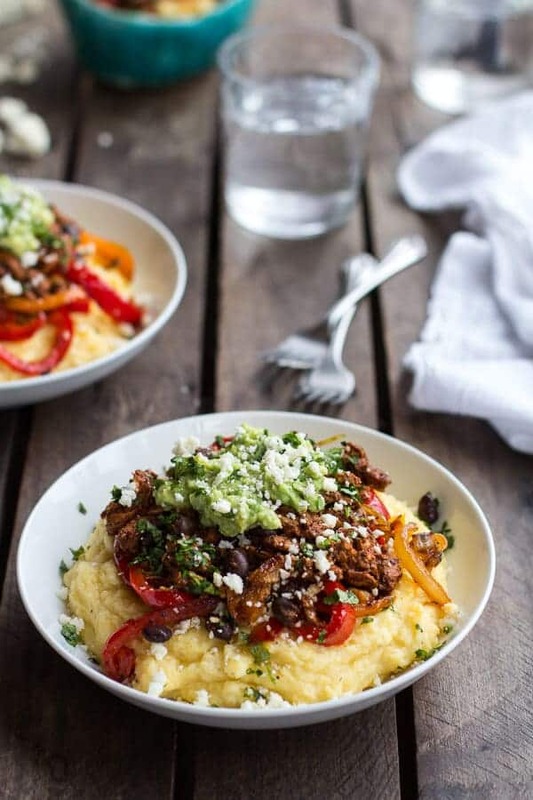 Shred the chicken and cook the polenta. Assemble as directed.To make this a vegetarian meal try swapping the chicken for lentils or chickpeas. Heat a very large skillet over medium- high heat and add the olive oil. When the skillet is hot, but not smoking (if it starts to smoke, turn heat down a bit and wait 5 minutes before adding the veggies) add the onions and red and orange peppers. Stir fry the peppers for 3-5 minutes, until they just begin to soften. Remove from the skillet and set aside. Keep warm by covering the plate with foil. Add another tablespoon of oil to the skillet. Add the chicken and brown on both sides, about 3-4 minutes per side. Once the chicken is browned all over add the the enchilada sauce, chili powder, smoked paprika, cumin, salt, pepper, cayenne, garlic and onion powder and bring everything to a boil. Reduce the heat to a simmer and simmer the chicken in the sauce for 10-15 minutes or until cooked through and shreds easily. Meanwhile, make the polenta. Pour the chicken broth and milk into a medium size saucepan and bring to a boil. Lower the heat to medium and slowly whisk in the polenta. Cook, stirring frequently, until the polenta is soft and thick, about 15 to 20 minutes. Keep warm and then just before serving, stir in the cheddar cheese and butter, season with salt and pepper. If the polenta seems a little thick you can add a tablespoon of butter or extra milk. When the chicken is done cooking remove the chicken from the heat and shred the chicken with 2 forks right in the sauce. If your peppers have cooled off too much I would toss them with the chicken to get them warm again. Toss in the black beans until warmed through. 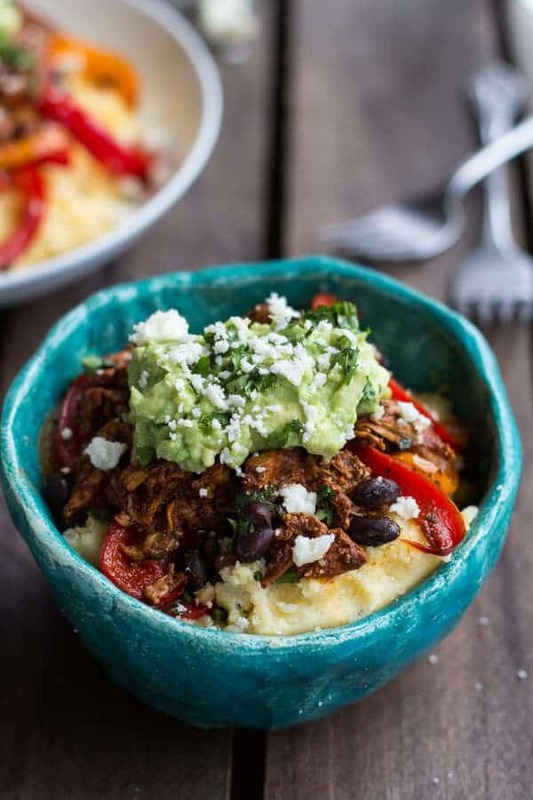 To assemble the bowls, add a nice serving of polenta to each bowl. Top with the peppers and saucy chicken. 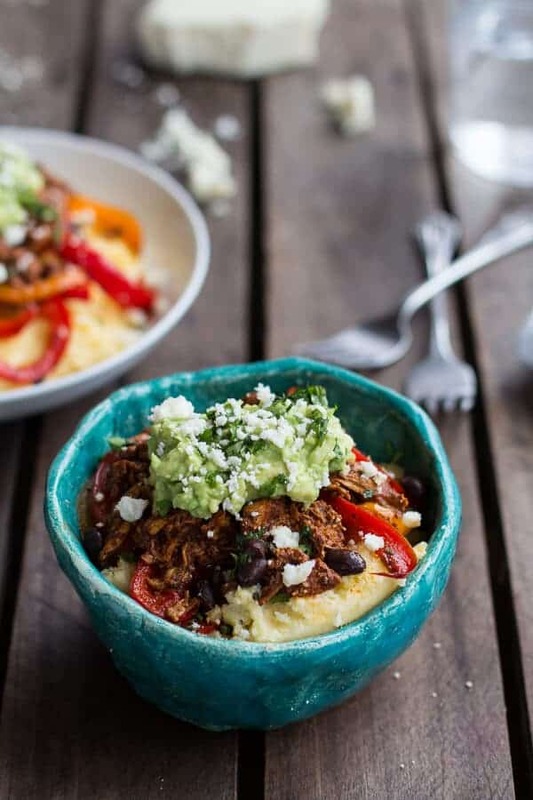 Finish the bowls off with a dollop of mashed avocado, crumbled queso fresco, chopped cilantro and crushed tortilla chips. Dig. In. Can we just please dig in now? YES. This is such a good idea! 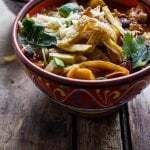 Definitely sounds easier than making proper tamales – can’t say I’ve ever attempted those but I could definitely give these a go! Beans sound like a great substitution. I have never tried polenta OR tamales, but they have been on my “to try” list for a bazillion years. This looks like the perfect dish to start ‘er off! Plus, one bowl is my language of love. Yum! 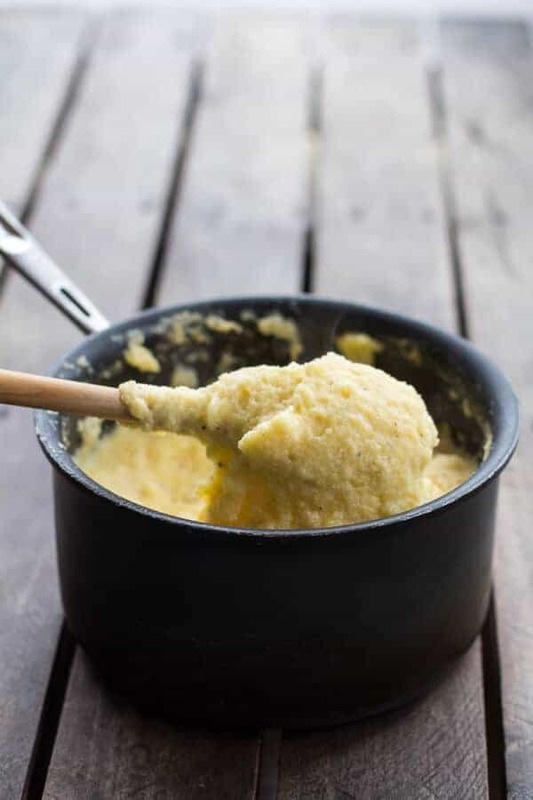 You have to try polenta!! You will love it! Absolute perfection – these look incredibly yummy! I love tamales, this is definitely going to be made in my household! 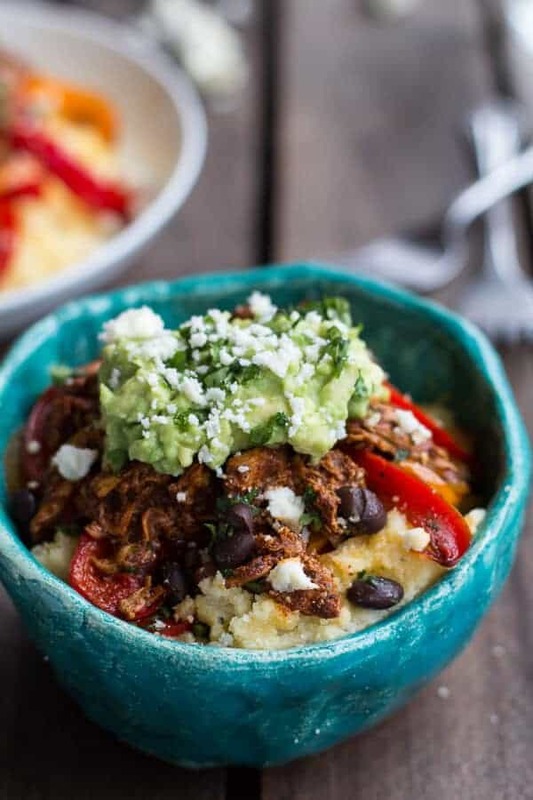 This tamale burrito bowl makes me hungry for some Mexican early this morning!!! Now I can’t wait for lunch so I can satisfy my craving 🙂 I love that you guys have a tradition of eating Mexican on New Years Day – sounds like a fun tradition, makes me want to start one! So I think you just need to move to New Mexico!! And open up a food truck that sells these bowls! Mexican is the best food to serve with that many people in the house, Tieghan! And I love your tradition of having Mexican on NYE. 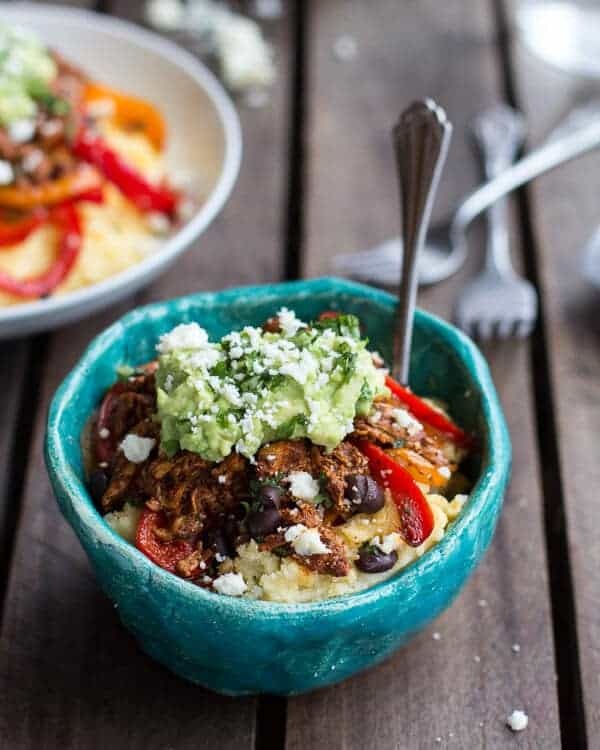 I haven’t had a burrito or a burrito bowl in ages and would love to try it at home. A lentil version would be so good!! But I’m loving the shredded chicken. PS: your bowls are adorable! THanks Sally!! I love that bowl too! Believe it or not it’s a bowl my younger brother made in art class a few years ago. I totally stole it, but it is honestly one of my favorite bowls now! This looks so good! I love tamales but I’ve never tried making them (too intimidated). I think this needs to happen soon though! This looks so incredibly delicious!! Love the flavors!! 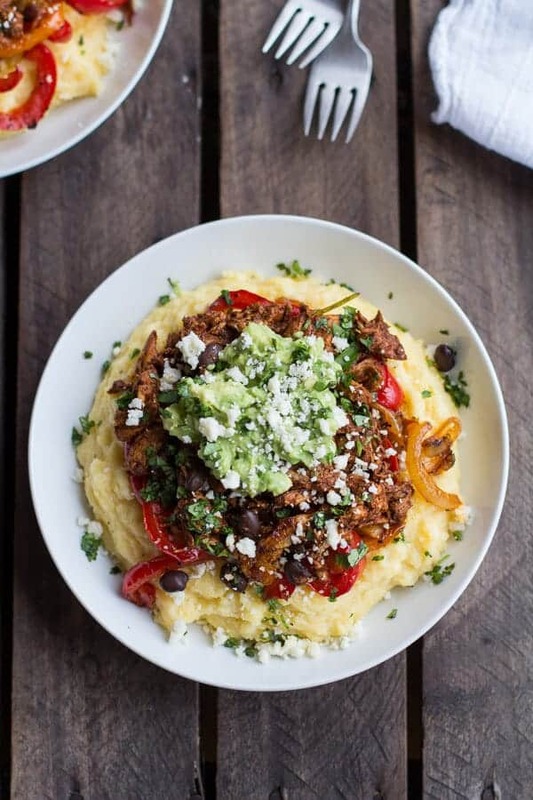 Love the idea of polenta! Living in San Diego I’ve grown to really enjoy Mexican! I also love that blue bowl! So pretty. My grandma makes tamales every year at Christmas, and it’s something my parents started doing close to ten years ago as well. I’m preparing to take on the tradition in the next few years with my own family. We always invite people over on Christmas Day and everyone pitches in making them, and then we all get to enjoy them at the end of the day! It’s a really fun tradition. Spicy pork is my favorite (and what I grew up exposed to in my Tex-Mex family), but bean and cheese are great for the young ones. I think we’re going to pass on the tradition this year, but this might be a fun and WAY EASIER way to tide over our cravings until next year! OH I hope you love these if you make them!! Let me know! Mexican food must be on everyone’s mind because I’m seeing it all over! Burritos bowls rock. This is way easier than making tamales. I love tamales, but d@mn they are a lot of work! So much easier!! Thanks Naomi! These look delish! You think I can make the meat in a slowcooker? That would be amazing! I heart my slow cooker! YUP!! 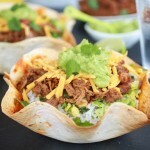 I actually included the slow cooker version in my recipe! I love tamales, these bowls look killer! Love this idea ~ so much easier than making a tamale! Fun for the holidays too. Now THAT is a big bowl of comfort! This looks delicious! I love the bright colours, and anything chicken and tamale is a yes in my book! My husband loves tamales but I’ve always been way to intimidated to make them. 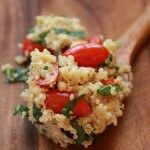 I ran across this on Foodgawker and it looks so easy and SO yummy! Thanks! Going to try these very soon! Oh these looks absolutely divine. I never make tamales because they seem complicated, this is perfect. Can’t wait to make it. Mexican on New Years is a tradition I could get behind. Granted, I could eat Mexican every day and be a happy camper. Wow, Tieghan, I’m totally drooling over this idea. I’m pinning so I can make this over the weekend. I’m curious if you shoot with a macro lens, because the detail in your photos is always so stunning…? I am loving the polenta base for these. That bowl up top is perfection! Where’s mine? Thanks Shaina! I love polenta! Yum! 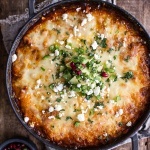 Love the cheesy polenta at the base! I’m confused by the crockpot version – do you cook the chicken separate? The instructions say to not add the chicken to the crockpot? Opps! Sorry Sherry, this is a typo. Everything goes into the crockpot all at once. Let me know if you have any more questions. Thanks so much, Amanda! So glad you loved this! I so want to make this!!! I haven’t been able to find “dry polenta” mix at the grocery store. Can I use corn meal? Hey Meredith! Cornmeal will work, but just know that the flavor will be slightly different. Still good though! appreciate your current fantastic content right here.I favor that quite definitely.I am aware which you placed considerably focus of those articles, since every one of them sound right and so are invaluable.Nowadays, finding a high quality post is really difficult. I’d like also to thank my friend for giving me the URL of your blog. Hope you appreciate my short comment.Your website is so cool. I’m impressed by the details that you have on this blog. It reveals how nicely you perceive this subject. Bookmarked this website page, will come back for extra articles. I am making this tonight. When do you add the black beans? After you shred the chicken add the black beans and cook five minutes or until warmed through. Hope you love this! I made this tonight (minus the beans) and it was delicious! * Polenta is surprisingly expensive. Used cornmeal – it was fantastic but didn’t take nearly that long to cook. Seriously, whisked it in and it was thick and soft within five minutes. * Didn’t have tortilla chips and really didn’t miss them. It was really fantastic, and my husband loved it despite being cranky with a cold. We ate most of the polenta, but had a lot of chicken and veggies left: I’m looking forward to wrapping it in tortillas for lunches! LOVED this! We have already had two dinners from this recipe and have enough for one more meal. Thanks so much for a great recipe! Yes!! Thanks So much! I am thrilled you guys are loving this recipe! I made this last night but with a few changes. I used Trader Joe’s pre-cooked polenta, so I cut out several ingredients and steps. Although cooked through, my chicken didn’t easily shred with two forks, so I ended up burning my fingers trying to get it apart with a combination of a knife and fork as well as pulling the meat apart with my hands. Next time, I’ll pre-dice the chicken when cooking. I’ll also dice (instead of slice) the peppers and onions to make them easier to eat/bite-size. That said, it was a hit! My husband and I love it. Sorry about the chicken not shredding for you, but happy you still loved this! Okay, I just made this and it is out of this world delish! I also used Trader Joe’s pre-cooked polenta and red enchilada sauce. I skipped the black beans but other than that, it was a perfect lunch for me. 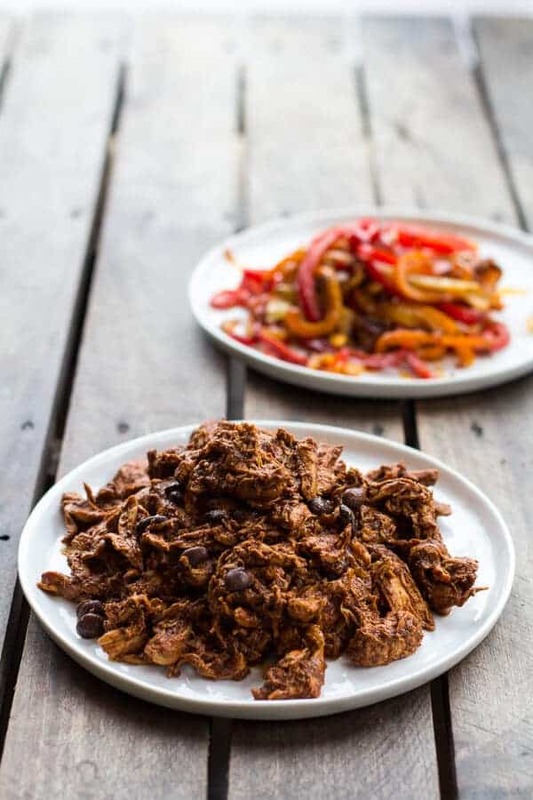 By the way, my weekly menu for this week includes several of your recipes 🙂 I always link your site in my blog posts – every one of your meals have been so delicious! Thanks for sharing! Ya! So happy you loved this and are trying more recipes. Thank you! I am beyond obsessed with your blog little ladie. I have made it a new weekly tradition to try a new one of your recipes a week. I have to say they all become everyone’s “favorite new meal”….well until I cook the next one. Thank you for helping me become a somewhat decent cook 😉 However, I have to say this one is absolutely beyond. The most amazing little mixture ever! Aww! This is awesome! Thank you so much and I am so happy you all are enjoying my recipes. Thanks for reading and making them!! Just finished cleaning up the dishes from this wonderful meal. It will be a staple in our home. I did the crock pot version and forgot to put in the chicken stock. It was fine, but maybe because I make my own enchilada sauce. I used beef instead of chicken. So excited you loved this. THANK YOU! This dish was delicious! I would never think to eat polenta this way. We have a lot of leftovers too. I would decrease the cayenne next time since I am a wimp when it comes to spicy foods. Also, I noticed that you left the measurement out for the olive oil. Might be disconcerting for a beginner. Thanks for the great recipe! Also, thank for the heads up about the olive oil. I will fix that. So excited you are loving this recipe!! Thank you so much! This is the best recipe ever! My family loved it. Thanks for sharing your recipe. Thank you! I am so excited your family loves this! This looks amazing! I can’t wait to try it. Question: where did you get the teal bowl, or did you make the bowl yourself? It’s so gorgeous! Thanks so much! My brother actually made that bowl in art class. LOL! Made this for dinner and really, it was so good! I’v never used polenta before so bought pre made at Trader Joe’s thinking it was the only option. Next time I’ll look for the polenta meal to prepare like you have it because I know it would be so much better. I love the vegetables cooked like they are, the chicken cooked in all that flavor, the fresh toppings. Just a great meal my kids loved too (held back on the heat though). I need to try this again when I can find the queso fresco cheese and avocados that haven’t over ripened (uug. was so bummed). The dish was great even though I missed out on a few things. Thanks so much! Oh yeah, you have to make the polenta from scratch. It’s creamy and delicious!! So happy you loved this, thanks! Again, I love the recipes I’ve tried of yours. Can’t wait to try more! I made this for dinner tonight…..YUM! Waaaayyyy easier than making tamales! My husband said, “Damn this is good”, lol! He never uses that word! Very tasty and easy! Thanks for the recipe! I had to create a board just for all your delicious looking Cinco de Mayo recipes!! Love it!!!! I can’t believe you decided to make tamales for the first time for a group of people and on New Year’s Eve. That is ambition! In Mexico tamales may be made with beef but in Honduras they are made with chicken. Every Christmas my mom or an aunt makes a giant batch of tamales and then there is tamales for days. I haven’t learned to make them and I don’t think I ever will, I’m too lazy for all the process but I’ll give these a try. I find that I try new things for large groups often for some reason! Having a giant batch on christmas sounds so so good!! They can take a while to prepare! Hope you love the bowls, thank you! A friend made this recipe for us when they had us over and we loved it. I’ve never made it myself though- how many servings does this recipe “as is” make? Trying to plan for about 10 ppl but not sure if I should double or how to plan related to that number. Thanks! Hi Kristel! This recipe will serve about 6, so I would double it to be safe. Let me know if you have questions. Hope you love it! Made this tonight in my instant pot. It was a little strong on paprika as that’s a strong flavor in enchilada sauce anyway. Otherwise really good with polenta. Will adjust spices next time! Thank you so much Pegi! I am so glad you loved this recipe!